I responded to a BMJ review of Sami Timimi’s book Pathological child psychiatry and the medicalisation of childhood, when the book first came out in 2002 (see response). This was before the publication of Post-psychiatry (discussed in a previous post). So, if Post-psychiatry is seen as one of the first texts of the Critical Psychiatry Network, Sami’s book has priority. Sami has published several other books since (see list on Wikipedia page). He also wrote a chapter for my Critical psychiatry book. Sami came to England from Iraq when he was aged 14. This means he is very aware of discrimination, although during his training he found himself “becoming more and more critical of ... Arabic culture” (p. 126). Western powers’ involvement in war and destruction in Iraq led to him having a more balanced perspective (see my 2010 Openmind psychiatric update column). As Sami says, "[r]esistance is in my bones" (p.163). Sami found his psychiatric training “a very confusing experience” (p.1). He found it difficult to understand why he was being indoctrinated in the way he was. He came to appreciate that “the whole mental-health business is about belief systems rather than hard science” (p. 59). He also came to appreciate that "[c]hallenging the mainstream can be a lonely, isolating experience" (p. 71). As I’ve said before (eg. see previous blog), psychiatry is more like a faith than a science. I have tried to take this understanding forward by using Clifford Geertz’s definition of culture as "a system of inherited conceptions expressed in symbolic forms by means of which men communicate, perpetuate, and develop their knowledge about and attitudes toward life" (see eg. another previous post). Sami likened the kind of experience he went through to that described by Frantz Fanon when "black families in Europe often had to choose between alienation or adopting a European outlook and pretending that the racism around them did not exist" (p. 71). When seen as a non-believer at a pro-Ritalin and pro-ADHD conference, Sami "left the conference feeling he had attended an extremist cult convention" (p.85). Still, Sami is a child and adolescent psychiatrist and this field used to be a haven for those that wanted to escape the abuses within adult psychiatry. Sami rightly worries that the increasing biologising of childhood has brought child and adolescent psychiatry within these parameters. When he and I trained, we were taught that there were emotional and conduct problems in childhood. Now medical students tend not to be taught this, instead being told to focus on ADHD and autistic spectrum disorders. Childhood depression, then, when we trained, was not recognised in the same way as adult depression, like it is now (see my BMJ letter). In his first book, Sami said, "In essence what all of us who are working in the field of therapy for social suffering are doing is acting as cultural interpreters" (p. 83). Here he is using the notion of symbolic healing. Psychiatric practice is “using culturally meaningful mediated symbols” (p. 80). Sami recognises the way in which the 'new transcultural psychiatry' criticises orthodox psychiatry for "not giving proper consideration to context" (p. 156). He utilises "post-modern therapies" (p.130), defined widely, to include narrative and solution-focused approaches. His honesty even leads to him at times sharing "information from my own life" (p.135). As Sami himself says, he has used "quiet persistence" (p.163) to get his message across. He has contributed significantly to modern critical psychiatry. Because of my scepticism, I was alerted when I saw the BJPsych editorial on cannabis and psychosis, which began, “It is now incontrovertible that heavy use of cannabis increases the risk of psychosis”. As I said in a previous post, some “heavy users of cannabis may be rarely unintoxicated, leading to misdiagnosis of the induced psychotic-like experiences, which are usually transient in less heavy users”. But I ended that post with the conclusion: “The causal link between cannabis and psychosis has not been proven”. The new editorial of course recognises that association does not mean cause. But it suggests that alternative explanations have been disproved. As I keep saying, the use of cannabis can cause emotional problems and people may use it to deal with their emotional problems. These problems may well be worse with skunk compared to hash (see Guardian article). Cannabis use is likely to be a proxy measure for poor premorbid adjustment associated with psychosis. I can't see that this most obvious explanation has been eliminated. I’ve posted before on Institutional racism and reform of the Mental Health Act. The Royal College of Psychiatrists has recently produced a position statement on ‘Racism and mental health’. Racial bias, of course, is not new in mental health services. There is also a history of attempting to tackle discrimination, which the College statement essentially ignores. True, it does make reference to the Blofeld report following the death of Rocky Bennett under restraint in my own NHS Trust. I worried at the time that the focus on institutional racism deflected from the other main issue about the dangers of restraint (see my BMJ response). Face down restraint should probably have been completely banned in mental health services (see previous post). This history is relevant to the current reform of the Mental Health Act, because, in a way, its aim could be said to be to reverse the trend for increased coercion associated with the last reform. As Inside/Outside said, "[I]t is essential to place progressive community based mental health at the centre of service development and delivery". Services are failing to provide an appropriate and professional service to people because of their colour, culture and ethnic origin. This situation needs to be legislated for in any new Mental Health Bill, focusing on reducing coercion. The recent Lancet study, which was reported in the media as ending the debate about the effectiveness of antidepressants, has ironically led to more discussion about their effectiveness (see previous post) and a welcome focus on the nature of discontinuation problems (see another post). It has also led to a definitive summary in a BMJ editorial of the evidence for short-term treatment (less than 8 weeks). Importantly, these findings [the Lancet study] do not support the widespread calls in the popular press for more people to take antidepressants because the meta-analysis and underlying trials do not examine who or how many people should be treated. [T]he way many of the results were reported does not allow clinicians to extract clinically meaningful take home messages to inform conversations with patients. This is partly because the Lancet study used odds ratios rather than risk ratios. It did not provide evidence about the proportion of people that improved on placebo. The typical placebo response in other literature is 30-40%. Using the average odds ratio from the Lancet study means about 10-12% more people in the treatment group would benefit compared to placebo. So, roughly 8-10 people would need to be treated for one of them to benefit compared to placebo. Knowing that roughly 80% of patients who get better did not improve because of the antidepressant underlines the importance of starting with low doses, systematically re-evaluating the need for treatment after a response is achieved, and not accepting any enduring adverse effects. I would also add that it’s important to realise that a good proportion of people are not helped even in the clinical trials. The BMJ editorial, therefore, usefully highlights the limited clinical scope of the Lancet study. We need at least to also focus on potential harms and long-term treatment. And, we need to ask whether the small statistically significant difference in clinical trials between active and placebo treatment could be an artefact due to placebo amplification (eg. see previous post). Clare Gerada defended the Royal College of Psychiatrists on the Today programme this morning against a complaint (of which I was one of the signatories) that the College is minimising the significance of antidepressant discontinuation problems (see Council for Evidenced-based Psychiatry (CEP) press release). There doesn't seem to be a dispute that antidepressant discontinuation problems occur (eg. see previous post) - Clare Gerada said in about a third of patients - and can be prolonged (see another previous post), but the issue seems to be whether they resolve for the vast majority of patients within two weeks. I don't think the evidence supports that view. There is a history of doctors thinking they know better about antidepressant discontinuation problems than the public (see my book chapter). The Defeat Depression campaign was a five-year national programme launched in January 1992 by the Royal College of Psychiatrists in association with the Royal College of General Practitioners. A door-to-door survey of public opinion was undertaken to obtain baseline data before the campaign started and most of the people questioned in the sample, that is 78%, thought that antidepressants were addictive. This finding caused some consternation amongst those running the campaign, because, as far as they were concerned, the public was misinformed on this issue. Part of the education programme, therefore, was to teach doctors that patients should be told clearly when antidepressants are first prescribed that discontinuing treatment in due course will not be a problem. Now they seem to be saying that it may be a problem but symptoms generally won't last long. The first official recognition in the literature that SSRI antidepressants can cause discontinuation problems was in a BMJ editorial in 1998, which suggested they were preventable and simple to treat. The same authors only two years later acknowledged that discontinuation symptoms are common in a letter to the Lancet. I agree there is little evidence of physical addiction, in the sense that the body gets addicted to SSRIs, but commonsense understanding of the word also includes psychological dependence, and despite what the Defeat Depression campaign said, the public knew, even if doctors did not, that taking antidepressants can become a habit. Doctors did not use their common sense to realise that discontinuing a drug that is thought to improve mood may cause problems - technically called a nocebo, or negative placebo, response. Antidepressants are likely to be habit forming, so however much the medical profession may declare that they are not primarily reinforcing like psychostimulants, the public has always understood that there may be difficulties in discontinuing antidepressants. The general public might reasonably have expected that psychiatrists, who are supposed to be specialists in disorders of the mind, would recognise psychological dependence, base their advice on clinical experience, and use their common sense. I have always encouraged CEP to focus on psychological aspects of prescribed drug dependence (see eg. previous post). I was even critical of the RCPsych leaflet (see another previous post) that has caused such disquiet, not least because it's been taken down from the College website before it's been properly reviewed, even though I thought it was generally a helpful leaflet. By the way, from the interview today, Clare Gerada, like her husband (see post), doesn't seem to believe in the placebo amplification hypothesis of apparent antidepressant efficacy, and I'm not sure why . I sent 7 tweets yesterday in response to a tweet from @PariantSPILab (who I have mentioned previously eg. see post) about a Financial Times article. Apart from several likes and a couple of retweets, I received only one answer from @Truthman30. Am I being marginalised? The article at least says that "precision psychiatry remains largely in the research phases". 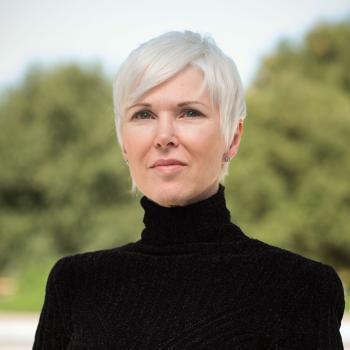 But, it quotes Professor Leanne Williams as promoting Spring Health, which says it has a research group that has had several papers published in leading medical journals, starting with one in Lancet Psychiatry in 2016. A Lancet Psychiatry article, published in April 2017, has a lead author who declares that he holds equity in Spring Health. I'm not sure how much Spring Health charges employers for its services provided through health insurance plans. I've commented before on an article by Leanne Williams (see post), which I think must be the 2016 article referred to by Spring Health. I've no idea what the evidence is referred to in the Financial Times article about venlafaxine only working for certain gene types. I'd never heard of Thalia Eley's attempts to develop "therapy genetics”. I can understand Leanne Williams wanting more money to fund her research but it does need to be tempered with realism. She says it's "bordering on negligence to not be using a [precision approach to depression care] now". Actually, it's not justifiable clinically to say that everyone needs brains scans and DNA tests for mental health problems, which is how the article headline is framed. What we need is a truly personalised medicine and psychiatry, not what's called individualised or precision medicine, which is actually commercialising mental health care not making it more personal (see previous post). Psychiatric research has lost its way (see another previous post). We need to accept the uncertainty of psychiatric practice and medicine in general, rather than promote "precision medicine" as the solution to mental disorders (see another post). Actually what we need is proper precision thinking in psychiatry, not the speculation being promoted (see post). I have blogged previously on the Power Threat Meaning (PTM) Framework (see post). Twitter is not always the best place to discuss these kind of issues, as people can act out their nastiness. I don't think people who have called the Framework 'anti-psychiatry' are necessarily "nasty". 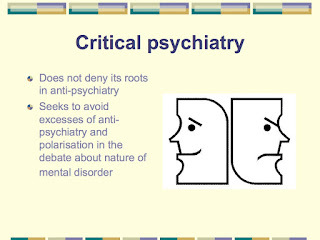 But it might be worth thinking about what it means to label someone, and even the PTM Framework, as 'anti-psychiatry' (eg. see previous post). Even respectable psychiatrists recognise some value in what has been called anti-psychiatry (see another post). 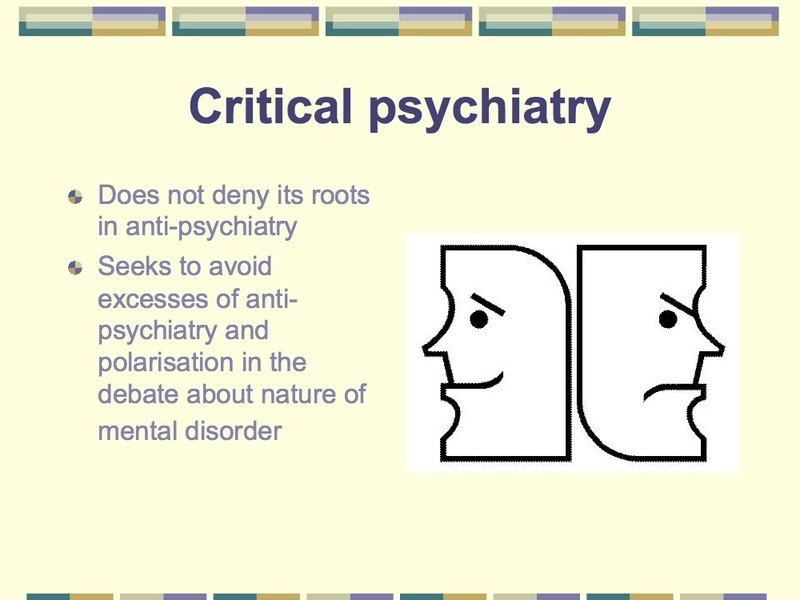 Critical psychiatry may have its roots in anti-psychiatry, but critical psychiatry also has its roots in mainstream psychiatry and in that sense is not anti-psychiatry (see another previous post). The term 'anti-psychiatry' has always been used as a way of psychiatry marginalising its critics. Anti-psychiatry has been called psychiatry's "nemesis" (eg. see another post), as other branches of medicine don't really have their own internal anti-movement. I want to encourage people to view the PTM Framework positively. Lucy Johnstone, in a recent MIA podcast, has made clear that any attempt to describe patterns of responses need to be recognised as meaning-based differentiations, not absolute distinctions. I totally agree. I'm not suggesting returning to Meyer's attempt to classify reaction types, but I have long argued that we need to return to his theoretical principles (eg. see another previous post). Revisions of the DSM have been totally misguided (see yet another post) and the PTM Framework should be seen as a potential way forward. 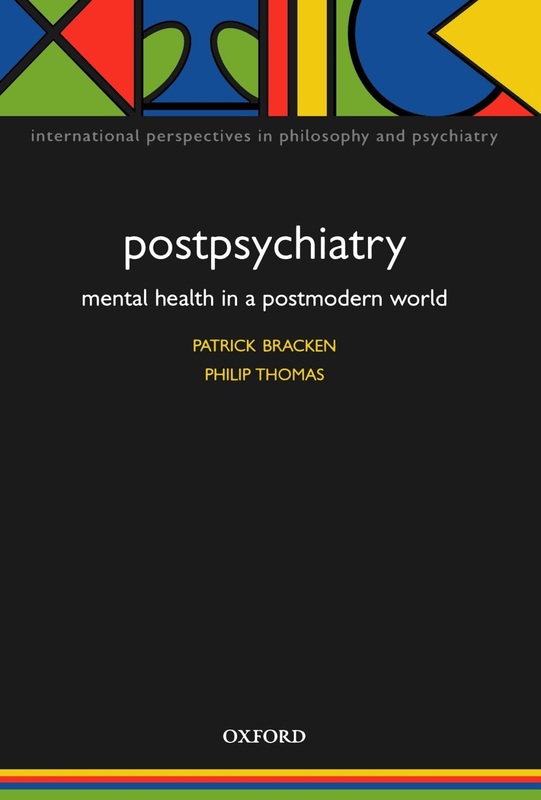 I have been re-reading the book Postpsychiatry by Pat Bracken (see previous post with link to his profile) and Phil Thomas (see his About Me webpage). They also wrote a chapter for my Critical Psychiatry book and a recent book chapter entitled 'Reflections on critical psychiatry' (see another previous post). Other pieces they have written together include a PPP article. Postpsychiatry started life as a series of short articles in Open Mind magazine [see reprints] from 1997 – 2001 .... This was followed by an article in the British Medical Journal Education and Debate section (Bracken & Thomas, 2001), and a book of the same name four years later in Oxford University Press’s series on philosophy and psychiatry (Bracken & Thomas, 2005). Postpsychiatry sees psychiatry as a creation of the Enlightenment and a modernist enterprise. The book starts with a reference to Foucault's Madness and Civilisation. Foucault viewed the Enlightenment as oppressive and saw the 'great confinement' in the 17th and 18th centuries as, in Pat and Phil's words, "a massive European move towards the social exclusion of 'unreason'" (p. 91). Pat and Phil note that Foucault moved away from an understanding of power as something negative. As they also say, "in the 20th century, psychiatry became something bigger than simply the governing power of the asylum" (p. 93). They, therefore, view postmodernism as "an addition to, rather than a rejection of, previous critical positions" and insist that it is "not a flight to mindless relativism" (p. 95). Just to be clear, they say that "Foucault did not get everything right" (p.189). They, therefore, want to also follow Heidegger and Wittgenstein with a hermeneutical perspective. In the book, they look at what they call the narrative turn in medicine and psychiatry. Overall, they are not proposing "some sort of postmodern canon" (p.189). Postpsychiatry is, therefore, not arguing for a strong form of social constructivism. My main problem with postpsychiatry is its historical narrative, maybe because it starts from Foucault. I have always tended to emphasise that there has always been a critical perspective within psychiatry (eg. see previous post), since the origins of modern psychiatry, which I would tend to date from state intervention in the asylum, rather than the 'great confinement'. The development of pathology in medicine from the beginning of the nineteenth century and the application of the anatomoclinical method led to psychiatry not completely fitting with an organic understanding of illness and, for example, produced the idea of functional psychosis (see another of my book chapters). Although Pat and Phil mention the Enlightenment, they don't talk about Romanticism, which, in a way, was a reaction against the norms of the Enlightenment. I have highlighted the work of Ernst von Feuchtersleben in this respect (see eg. another previous post) and he used the critical philosophy of Immanuel Kant to argue against a materialistic understanding of mental illness. Similarly, modernism wasn't the only perspective at the turn of the twentieth century and, as I have said, Pat and Phil themselves mention hermeneutics. Personally, I have emphasised the pragmatic perspective of Adolf Meyer (eg. see another previous post), which, at least in theory, focused on the limitations of psychiatric practice (see eg. my article). Postpsychiatry may be the best known form of critical psychiatry and is central to critical psychiatry's understanding of its own nature.